About a month ago I was sent an article from The Independent entitled, “More Than Half of Millennial Women Don’t Identify as Feminists, Poll Finds.” The article went on to state the result that 54% of women surveyed not identifying as feminists is “staggering.” Without some context, this might be a discouraging headline. I would argue that it is in fact intended to be a discouraging headline. To counter that discouragement I’d like to provide some context so we can all breathe a sigh of relief and get back to our feminist agenda. The poll that the Independent was referencing was sponsored by Refinery29 and CBS News using the company YouGov. YouGov surveyed 2093 adult women in the US in July 2018, reportedly using a representative sample. The poll was conducted online—which is biased by nature because of the high degree of self-selection. These types of polls are difficult to accurately analyze because they aren’t published the way an academic study would be with full methodology, survey questions, and results. There is no peer review process to ensure quality work. Refinery29 was able to pull the data they wanted and represent it in a way that fit the narrative they wanted to tell. In their page on the poll results, they don’t break out the question “Do you consider yourself a feminist” by age range. The result was just listed as 54% don’t and 46% do. 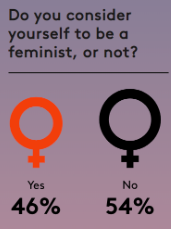 However, in the article they posted about the results, they say 54% of “young women” don’t consider themselves feminists. I assume this is where the Independent gets their title about Millennial Women. In the article, Refinery29 then says that only “34% of American women 36 and older call themselves feminists.” Where do they get this number? It isn’t listed in the poll results that are public. So I have to assume that they have more data that they aren’t sharing with us. I want to see that data. The poll also asks questions about feminist issues like healthcare and abortion. The results of these questions indicate that regardless of how the women polled perceive the current feminist movement or the label “feminist,” they DO agree with feminist principles. That’s far more important, in my mind. I found a poll conducted in 2013, also by YouGov that asked the question to which I really want to know the answer: “Do you believe that men and women should be social, political and economic equals?” That poll found that of all Americans sampled (men and women), 82% held this belief. Isn’t that comforting? Looking at that same 2013 poll, the number of women who called themselves feminists was 23%. If we took the 54% number from the 2018 poll as accurate then in 5 years the number of women who identify as feminists has more than DOUBLED. Why wasn’t that the headline of The Independent article I was sent? For that answer we have to look to history. In 1991, Susan Faludi published Backlash. This 500 page book delved into the phenomenon of the feminist backlash that was rampant in the 80s and continued into the 90s. The progress being made toward equality for women in the 70s and 80s made a lot of people uncomfortable. It disrupted the status quo. Our society was changing and quickly. Mainstream culture started retaliating against the women’s movement. This included a regular stream of articles with titles like “The Feminist Mistake” (The National Review) and “The Great Experiment That Failed” (Newsweek). The New York Times published articles claiming that women were depressed and confused. Newsweek warned that unwed mothers were “hysterical.” There were regular discussions in the mainstream media about the cost women paid for “equality” in the workplace. All painting a picture of a generation of women made miserable by their own insistence on equality. I can’t do Faludi’s book justice. It’s an incredibly insightful and honest look at the way our society has tried to deal with the changes that women have insisted on. It also serves as a warning that we should now be heeding. I could use the exact same YouGov numbers and paint a picture of a thriving feminist movement with their membership skyrocketing. If I had the full set of quotes from respondents I could have cherry picked comments that would have strengthened my position. The presentation of the YouGov polling numbers isn’t an accident. It is our backlash. The women’s movement is making progress—there is a record number of women running for House seats, #MeToo efforts have brought consequences to dozens of previously untouchable offenders, and there are nearly 3000% more women-owned businesses than there were in 1972 (that’s not a typo—the number is three thousand). All of this progress is further disrupting the status quo. Mainstream culture is defending itself from this change we are fighting for by trying to convince us that we aren’t really making progress at all. 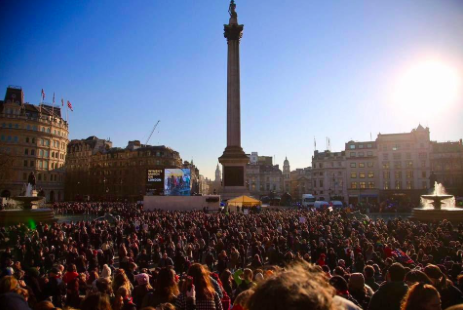 If you look, you will see lots of articles suggesting that the Women’s March wasn’t that big, that #MeToo is floundering, and that women don’t really like feminism. This is a good sign because it means we are doing something right. We are making meaningful strides or they wouldn’t bother trying to convince us we’re not.